Last minute pre-school trip | Mommy and Me Monday | 181 ed. This was the last weekend to do something before school started. There was little mommy guilt that we hadn’t done a big trip or anything this summer (after Michigan and Tennessee last summer and Houston the one before), the girls were in dire want of a trip. So, very last minute, we headed up to Chattanooga, TN to check out Rock City, Ruby Falls and the Incline Railway (<– click those to see more pictures from our trip and a little about them!). Honestly, I have no idea when we were in Tennessee and when we were in Georgia, but we all had a great time! On the incline railroad headed down the mountain. Only like a 72-degree incline. No big deal! Wow! Everyone is all big-smiles. Looks like ya’ll had a wonderful time. We need to get up there and see all that, too! Looks like everyone had a great time! I am glad it wasn’t too hot to do something fun outside, and that you escaped the rain for a day. I can’t believe Izzy starts 1st grade this week. I have always heard Ruby Falls is quite the sight to see, but we’ve never been – must put it on the list of places to go one day! 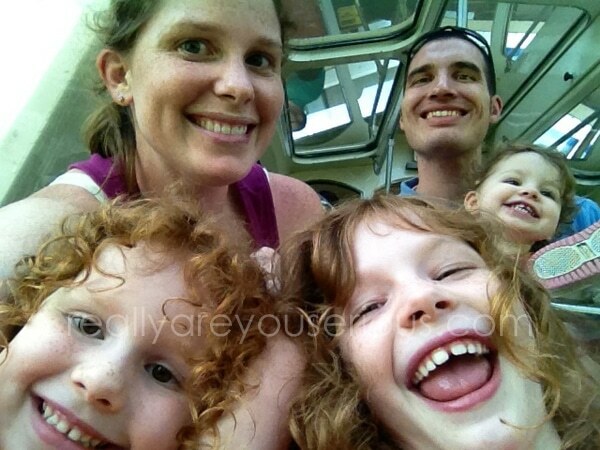 Best self-taken family pic ever! I so remember seeing all those signs when I was a child and my parents never stopped. I’m glad you took your kids!!!!! I ADORE this family photo!! I’ve never heard of Incline Railroad, but it sounds like a FUN place to go! That looks like so much fun! I visited Chattanooga a long time again. So much to do! What a fun last minute trip! YAY! Sometimes you just need those! I have mommy guilt that we didn’t have a summer vacation. Too busy but we did go to Costa Rica this year, so I keep telling the kids that our spring vacation was enough. What a cute photo. Everyone looks like they are having a blast! This is so fun! I love that part of Tennessee, although it’s been a few years since I have been there. leaving tomorrow for our back to school vaca! love me some road trips!! I love that picture, definite keeper! I love this picture because it made me smile hugely too! 😀 Great shot! Super cute!! I’ve never been there, but it sounds fun, the incline railroad looks great!